However, something was a touch ‘off’ about the very distant Cooper’s and I kept the bird in view as it slowly but surely worked its way closer to where I was standing. The closer it got, the better it looked for something even “better” than Cooper’s. It neared closer still and banked, providing a clear view of its entire body shape. 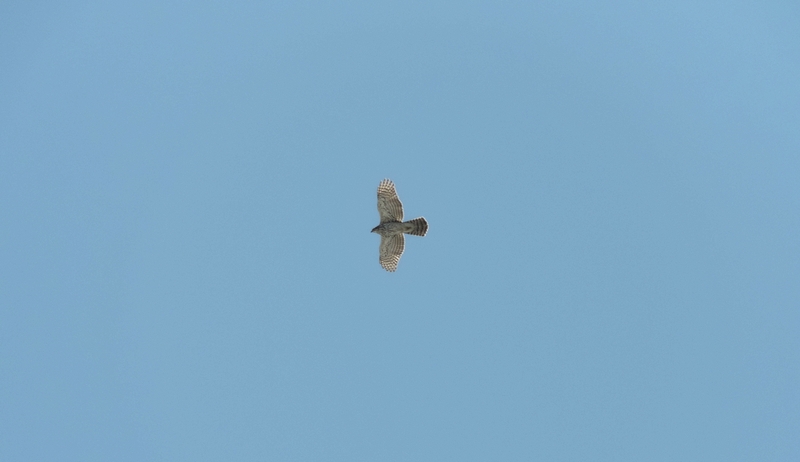 There was no doubt at this point….the bird was a goshawk! Photo: Note its head dwarfed by the width of its massive chest; and its long and broad tail fusing with its thick body. 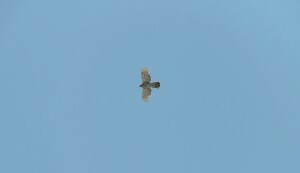 Also, the wings show a strong bulge at the secondaries and taper in width at the ‘hands’; a classic Northern Goshawk silhouette.